The great thing about this country is the number of festivals we have the opportunity to celebrate through the year. 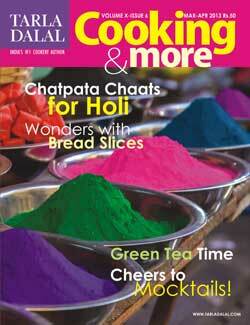 I would like to begin by wishing all our readers a very happy, colourful and safe Holi! May you enjoy the festival with family and friends over chatpata chaat and chilled drinks! And while we are talking about celebrations, let me remind you not to miss our article on mocktails – your guests will love the attractively garnished alcohol-free concoctions we’ve introduced. We have lots of interesting articles in this issue, as always! Let’s begin with something as ordinary as bread slices. So often we are faced with extra bread slices that we don’t know what to do with – take our innovative suggestions and you will be surprised how you can turn a mundane ingredient into an exciting preparation! In this issue we have also turned the spotlight on chickpeas or kabuli chana, a favourite ingredient in North Indian kitchens. Do you know that it can also be imaginatively used to make everything from soup and salad to starter and main course? Another common ingredient that is truly versatile is the humble carrot; not only is it chock-full of nutrients that are good for the eyes and skin, it also adds colour and flavour to a range of dishes. Make the most of the carrots that are plentifully available at this time of year. Fans of foreign food will appreciate our article on Lebanese cuisine, which is getting more and more popular world over. Try our range of easy-to-make recipes the next time you have guests over and watch your reputation as a host soar! We maintain our focus on health with a number of informative articles, including one on the amount of protein required by different age groups. My team of nutritionists has also worked on a special feature on the benefits of green tea, which I am happy to note, is finding increasing favour with the health conscious across the country. To wrap up the issue are our usual features on numerology, special recipes for Jains and diabetics, and snack ideas for perennially hungry kids! Enjoy the warmer days and continue to experiment in the kitchen!